Many guests at our Eugene hotel are in town for a Ducks game at Autzen Stadium or to visit the University of Oregon campus. Whether you're here for an event at Hayward Field or the Matthew Knight Arena, you need a Eugene hotel that's clean, comfortable and has a great location close to downtown. We're close to the University of Oregon athletic events and just a short drive from the Matt Knight Arena, so it's easy to quickly get to special events. Willamette Valley Wineries are a short drive away and there are many to explore. From the Oregon Country Fair to famous Oregon Ducks football, there's something for everyone near our Eugene hotel. Oregon Ducks basketball draws a crowd, and Oregon Ducks track and field is popular during the spring and summer months. Athletics are a way of life in this region, and we're happy to host Duck fans from around the nation. The Hult Center is also a popular destination, especially for business travelers. When you're traveling for work, you need a quiet, well-appointed room to get things done. The Federal Court House, Lane Events Center, university, and numerous local businesses all count on us to provide top notch accommodations for their out of town employees. In addition to a great location, our amenities are also designed with comfort in mind. Enjoy a relaxing day at our indoor pool. As a newly renovated hotel, we offer the cleanest, most comfortable accommodations in town. A state of the art fitness center is complemented with saunas, so it's easy to get that workout in or relax after a long day of football or work. Flat screen televisions are featured in every room because we understand how important relaxation is. However, it's our free breakfast that really makes us stand out. A daily buffet of hot pancakes, omelets, bacon, sausage, fresh fruits and pastries, cereals, yogurt, chilled juices and 100% Arabica coffee awaits guests. 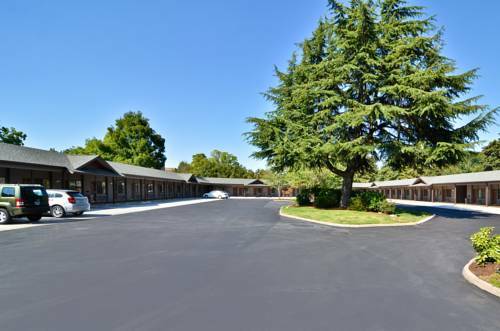 Reserve your renovated room at Best Western New Oregon for a great trip! Trev's: Adjacent to Trev's, Bar/Lounge, American, Open for: breakfast, lunch, dinner, Sunday thru Thursday: 8:00 a.m. 10:00 p.m. Friday & Saturday: 8:00 a.m. - 12:00 a.m.
From: Northbound on I-5. Take Exit 192. Follow signs to University of Oregon to the Best Western New Oregon. From: Southbound on I-5. Take Exit 194B. Follow signs to the University of Oregon and the Best Western New Oregon is adjacent to the University.